Head is still spinning about this one. Found the link yesterday and I'm having a hard time computing all the possibilities for the kids' rooms. This is really cool! Tell Justin welcome home! i just played for an hour on that site! thanks for sending the link! its fun!! oh and you were in my dream last night. probably because your email was the last thing i read before i fell asleep. funny! Thanks for sharing this site. 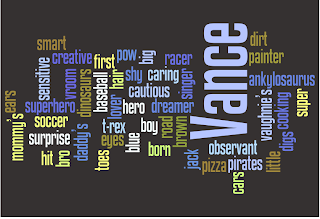 My brother is turning 50 this year and this will be something really cute to give him - all the words that describe him. Glad everyone is having fun with Wordle!